Which plant is this? - Which plant is this? I love it! Hi Leonie, thank you, we love it too! This picture has been clicked on many, many times. There are in fact two climbers on the wall. Left and right of the gate is climbing Hydrangea, Hydrangea petiolaris and the plant with red tinged leaves is Parthenocissus. 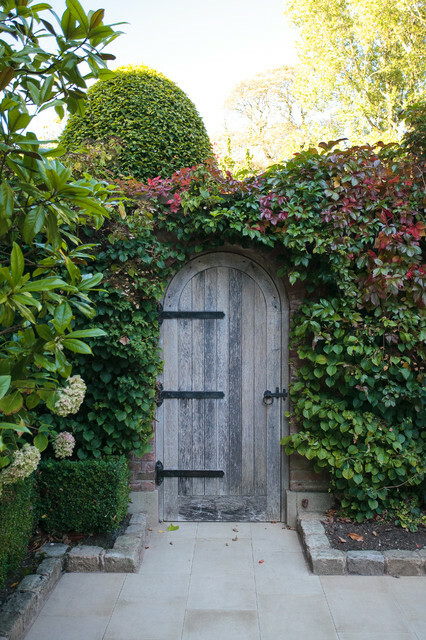 Show off a garden gateIf you’re lucky enough to have an original old gate – or, indeed, a new but traditional bespoke design like this – let it shine. Trim back those creepers, give it a good scrub and treat it with wood protector (choose a discreet or invisible finish; test a few somewhere out of sight first – the last thing you want is to accidentally make it look brand new or out of kilter with the rest of your garden’s style with orange-y fence protector).If you don’t have one of these hanging around already, or even a suitable opening to affix one to, could you find a lovely weathered version and prop it decoratively against a prominent wall as a feature? Surround it with plants that will soften its edges to help it to settle in.Tell us…How would you describe the style of your garden? And which ideas from here would you steal? Share all in the Comments section. Entrance through the garden to the house.